For four months from the 5th of October 1908 to the 2nd of February 1909 Edgeworth David, Douglas Mawson and Alistair Mackay made a return manhauling journey of 1,260 miles (2,027 km) from their base hut to the South Magnetic Pole and back again as a part of Ernest Shackleton's 1907-09 British Antarctic Expedition (the Nimrod Expedition from the ship used). After the 1st week of November this journey took place in 24 hour daylight. The first motor car in Antarctica - used to help lay depots before the main journey began and take the party of three a short distance at the start of their journey. Considering the route over a difficult area, the kind of terrain that occasionally had to be negotiated with the sled. The Magnetic South Pole is not the same as the Geographic South Pole, it is where the earths' magnetic field lines are aligned vertically upwards. It is detected using a dip needle (a kind of compass used upright instead of flat), when the needle is precisely vertical you have arrived at the south magnetic pole. 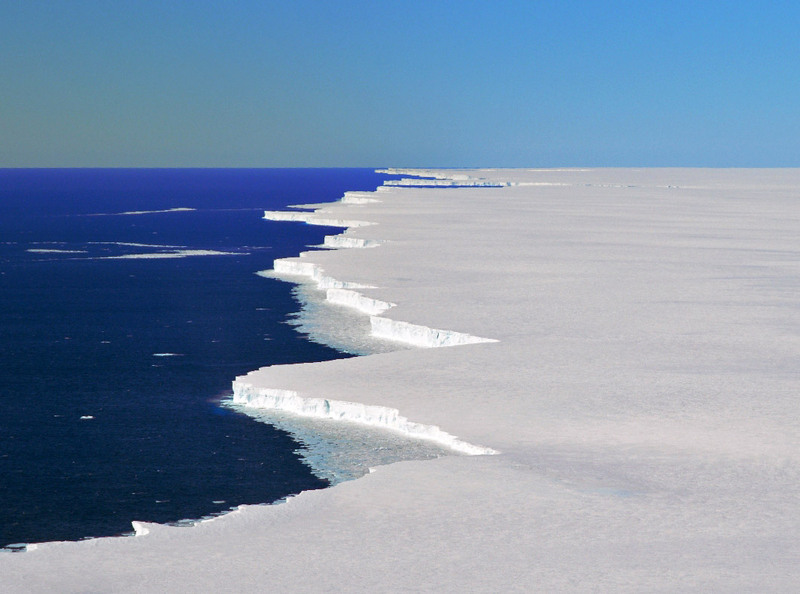 It is not fixed in place and wanders around an average place over the course of a year, over the longer term it can move many hundreds of miles, in 1908 it was inland in Antarctica, today it is in the Southern Ocean. Early expeditions used "depot laying" as a way of travelling further. Depots were places where food and fuel were left so that those on the main journey didn't have to take all of their supplies with them, which otherwise would have severely limited the distances covered. Setting out laying depots and returning to base each time greatly increased the overall travelling needed to allow the main party to travel relatively lightly, typically many more men would be involved in depot laying than went on the main journey. 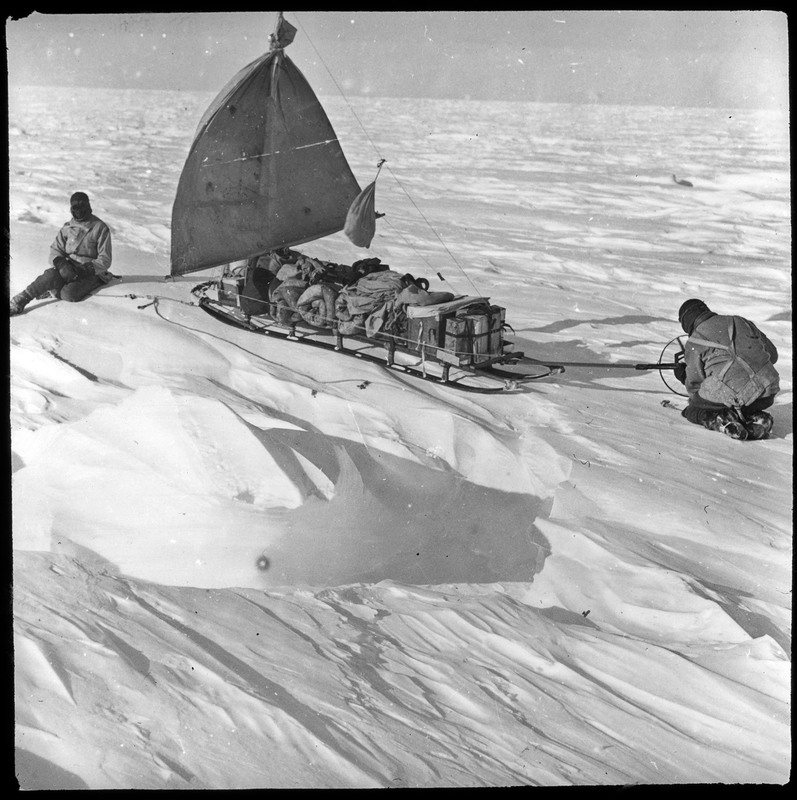 DEAR SIR, - The sledge-party which you have charge of consists of yourself, Douglas Mawson and Alistair Mackay. (1) To take magnetic observations at every suitable point with a view of determining the dip and the position of the Magnetic Pole. If time permits, and your equipment and supplies are sufficient, you will try and reach the Magnetic Pole. 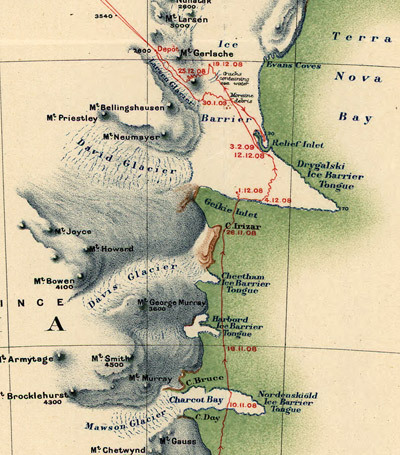 The route taken by what was known as "The Northern Party" was west across McMurdo Sound, from the expedition base at Cape Royds on Ross Island, over the seasonal sea ice before turning north along the coast again on seasonal sea ice for ease of travel before turning inland and heading for the Magnetic Pole. On the way back, the party was to survey the Dry Valleys region if possible, though this didn't happen due to a lack of time. October 17 - The day being calm and clear and free from either falling or drifting snow, we were able, for the first time, to turn our sleeping-bag inside out and air it in the sun. Previous to this the reindeer fur inside the bag* had become much encrusted with ice, chiefly the result of the freezing of our breath. We had previously hoisted sail on both sledges, and the wind was now sufficiently strong to admit of our pulling both sledges together. That night I experienced a rather bad attack of snow-blindness, through neglecting to wear my snow goggles regularly. *just the one big bag between the three of them. November 1 - ...we breakfasted off a mixture of our ordinary hoosh and seal meat. After some discussion we decided that our only hope of reaching the Magnetic Pole lay in our travelling on half rations from our present camp to the point on the coast at the Drygalski Glacier, where we might for the first time hope to be able to turn inland with reasonable prospect of reaching the Magnetic Pole. Mawson was emphatic that we must conserve six weeks of full rations for our inland journey to and from the Pole. This necessitated our going on half rations from this island to the far side of the Drygalski Glacier, a distance of about one hundred statute miles. We knew that there was a certain amount of danger in adopting this course, but we felt that we had got on so far with the work entrusted to us by our Commander, that we could not honourably now turn back. Under these circumstances we each wrote farewell letters to those who were nearest and dearest, and the following morning, November 2, we were up at 4.30 a.m. After putting all the letters into one of our empty dried-milk tins, and fitting on the air-tight lid, I walked with it to the island and climbed up to the cairn. 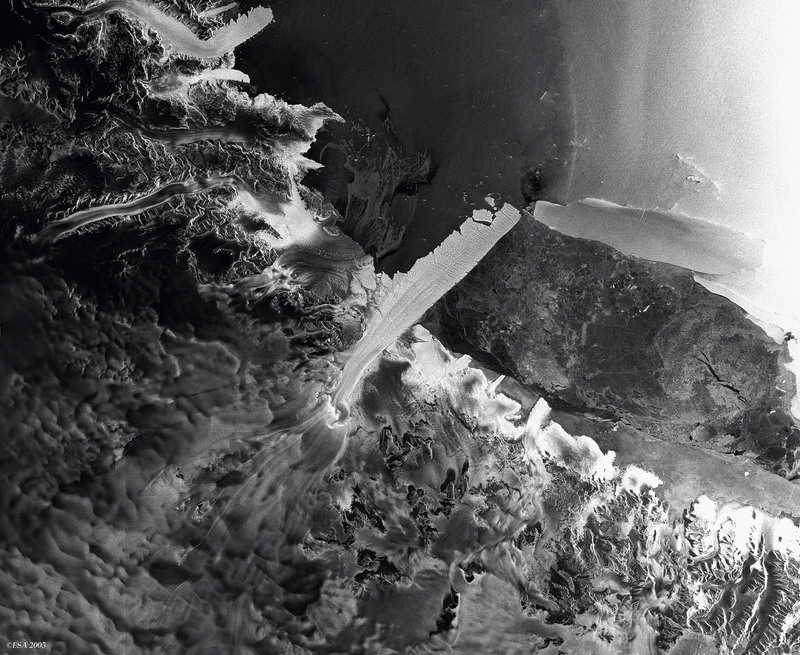 The Drygalski glacier tongue as seen from an aircraft, looking out to sea from landward. December 5-6 - Soon after midnight, we left our camp on the south side of the Drygalski Glacier, and struck across the high ridges of blue ice into the small valley in the glacier which we had prospected two days previously. December 14 - ... we were still busy preparing for the great trek on the morrow. Mackay was busy cooking Emperor penguin and seal meat for the plateau journey. We trudged through soft thawing snow with here and there shallow pools of water on the surface of the ice. This, of course, saturated our socks, which froze as the temperature fell during the night. 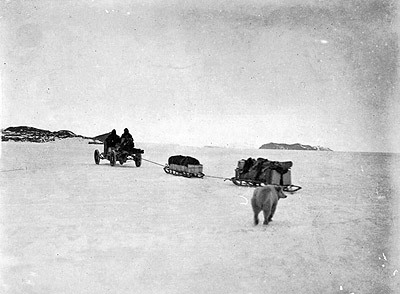 January 16 - We were up at about 6 a.m. and after breakfast we pulled on our sledge for two miles. 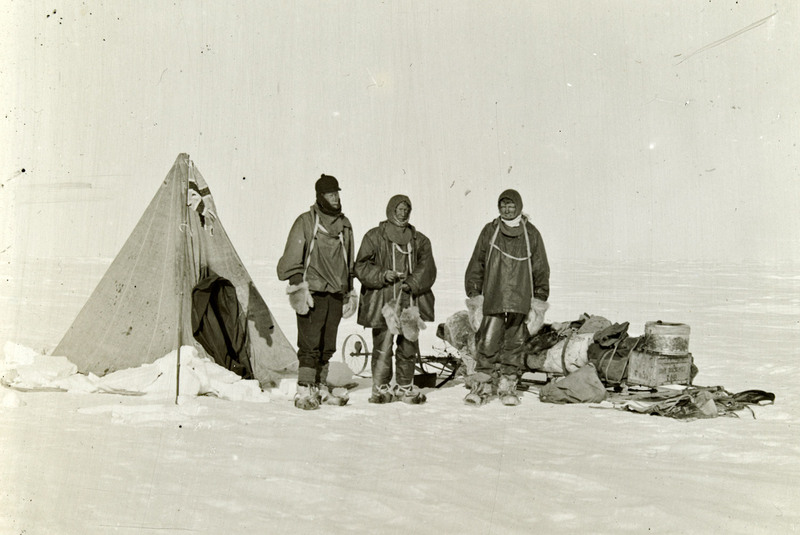 We then depoted all our heavy gear and equipment with the exception of the tent, sleeping-bag, Primus stove and cooker, and a small quantity of food, all of which we placed on the sledge together with the legs of the dip circle and those of the theodolite to serve as marks. 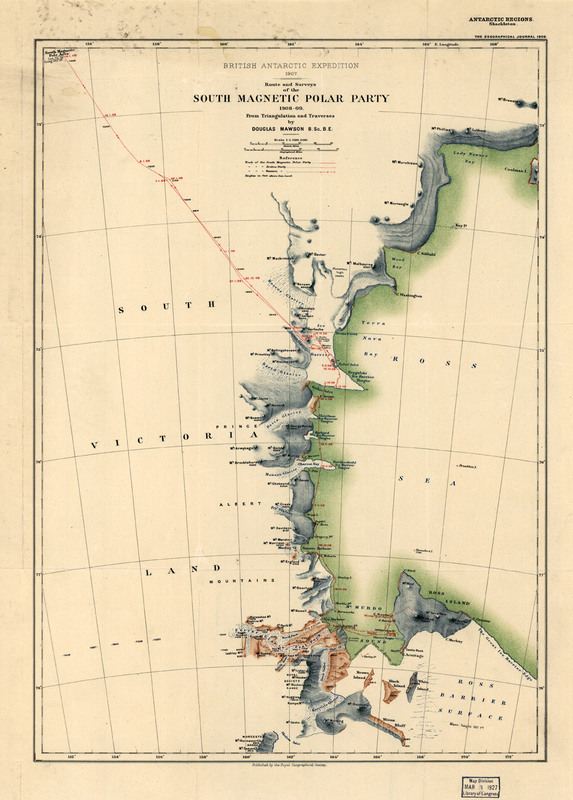 .... We then walked five miles in the direction of the Magnetic Pole so as to place us in the mean position calculated for it by Mawson, 72° 25' South latitude, 155° 16' East longitude. Mackay and I fixed up the flag-pole. 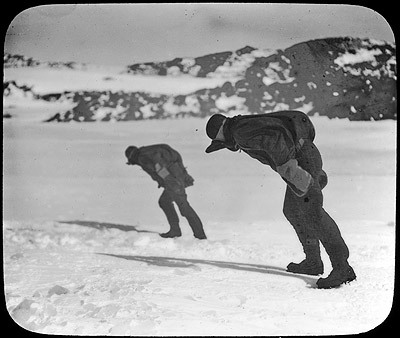 We then bared our heads and hoisted the Union Jack at 3.30 p.m. with the words uttered by myself in conformity with Lieutenant Shackleton's instructions, "I hereby take possession of this area now containing the Magnetic Pole for the British Empire." At the same time I fired the trigger of the camera by pulling the string. Then we gave three cheers for his Majesty the King. January 28 - A blizzard was blowing, and after breakfast we had much difficulty in the cold wind in getting up the mast and sail. Mackay, who usually did the greater part of this work, got his hands rather badly frost-bitten before our preparations were completed. January 30 - We found that, owing to the alternate thawing and freezing of the snow at our depot, our ski-boots were almost filled with solid ice. 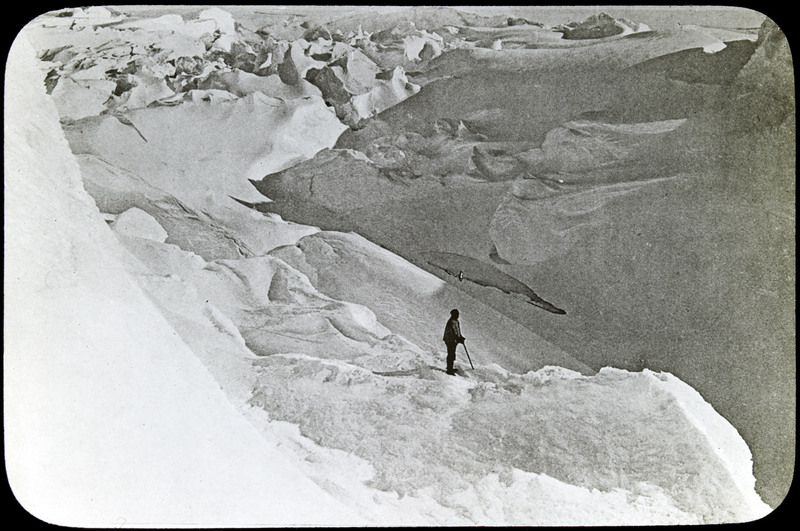 The work of chipping out this ice proved a slow and tedious job, and we did not get started until about 11 a.m.
February 3 - Mawson gave tongue first, roaring out, "A gun from the ship!" and dived for the tent door... A sudden shout from Mackay called me back to earth, "Mawson's fallen into a deep crevasse. Look out, it's just in front of you!"... 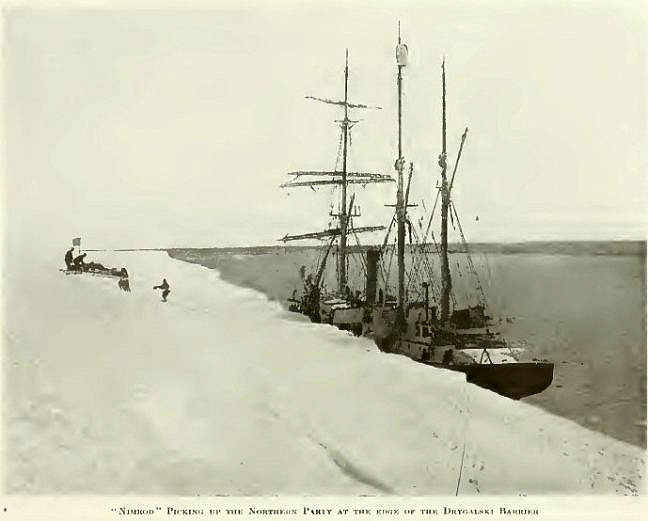 Mackay shouted to those on board, "Mawson has fallen down a crevasse, and we got to the Magnetic Pole." The crevasse was bridged with a suitable piece of sawn timber, and Davis, with that spirit of thoroughness which characterises all his work, promptly had himself lowered down the crevasse. 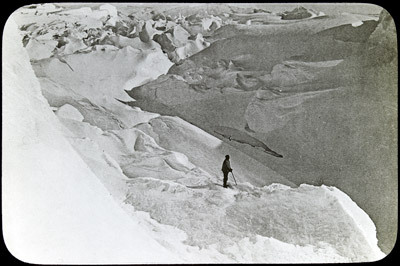 On reaching the bottom he transferred the rope by which he had been lowered to Mawson, and with a long pull and a strong pull and a pull altogether, the company of the Nimrod soon had Mawson safe on top, none the worse for the accident with the exception that his back was slightly bruised. As soon as the rope was cast free from Mawson, it was let down again for Davis, and presently he, too, was safely on top. We heard of the narrow escape of Armytage, Priestley and Brocklehurst, when they were being carried out to sea, with only two days' provisions, on a small ice-floe surrounded by Killer whales; and how, just after the momentary grounding of the floe, they were all just able to leap ashore at a spot where they were picked up later by the Nimrod. Pleasantly the buzz of our friends' voices blended itself with the gentle fizzing of steam from the Nimrod's boiler, and surely since the days of John Gilpin "were never folk so glad" as were we three.